So I've had this dough bowl for months, and it's sat empty for that same amount of time. I just didn't know what to do with it, and then other projects came up. I've moved it to a few spots, but have ultimately landed on it residing in my dining room. 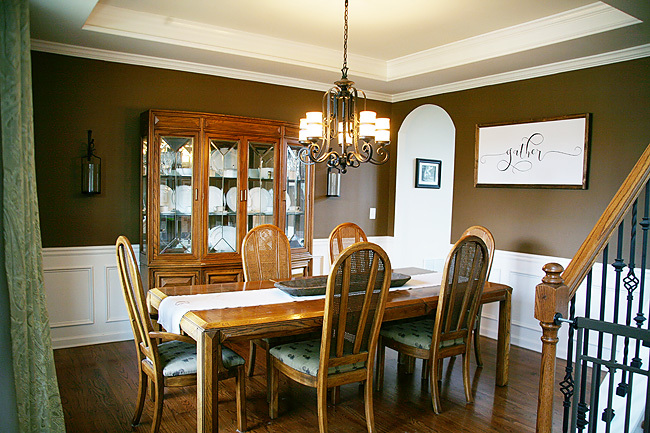 Sadly, my dining room is a whole other project that's been in the works for some time. I know what I want to do with it, but it's been one of those projects that I always put on the back burner. Which is crazy because it is the very first room you see when you walk into our home. 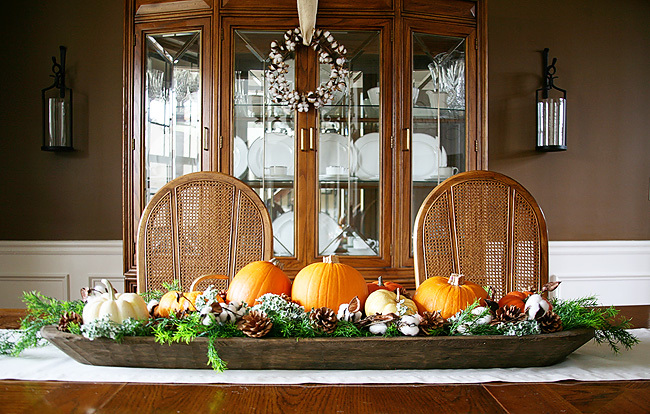 This year I am hosting Thanksgiving, and have decided to tackle part of the dining room before we host several guests. The easiest part of this little mini redecorating project so far has been decorating the dough bowl. I wasn't sure what to do at first, and looked to Carrie Beth for inspiration. 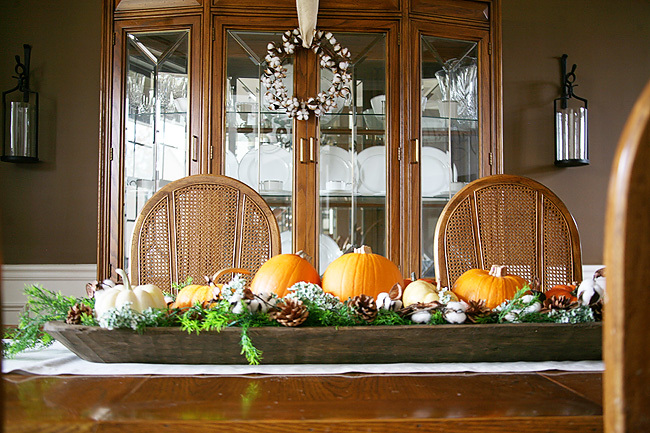 She has an antique dough bowl she inherited from her grandmother, and always changes it out depending on the season. 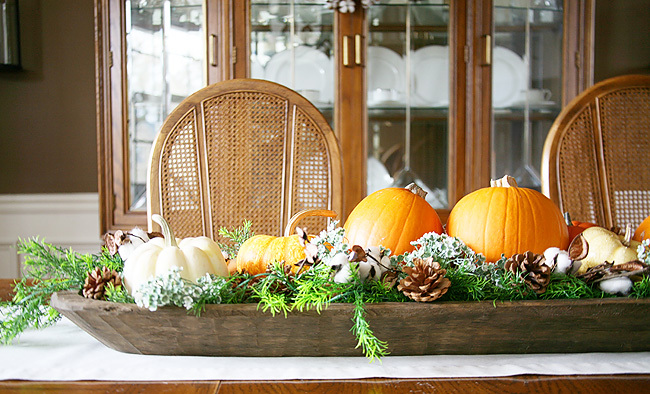 In warmer months she puts lemons in it, and in the Fall she adorns it with pumpkins and other seasonal decor. 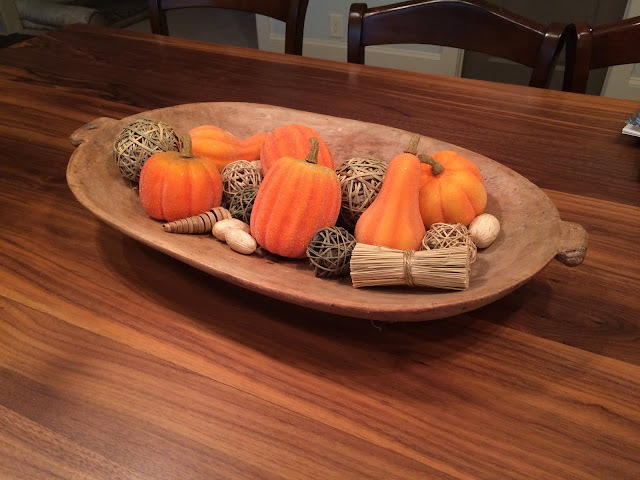 The pumpkins were kind of the route that I was thinking, so after perusing a few ideas on Pinterest, and stalking a few of my favorite home decor feeds on Instagram, I came up with an idea to decorate my dough bowl that would also fit into the style of my dining room. I drew it all out and then began browsing around to bring my idea to life. I have an amazing drawing of this, but no need to burn your eyes with one of my inspirational decor masterpieces. Some talents should just remain hidden. One of my worries was that I didn't want this project to be too expensive. My dough bowl is large and long. I wanted to be able to give it that full look with out a full hit to my bank account. I also wanted it to last, and have the idea to some how switch out the pumpkins for something else once the holidays roll around. Candles maybe? Well, I needn't worry one bit because somehow when I was shopping for items for L.C. 's birthday party on Oriental Trading I stumbled upon some items from the idea in my head that would be perfect for filling the dough bowl. They were inexpensive and just what I was looking for. I incorporated a few things on had an hand and I knew it would be just what I had envisioned in my head. 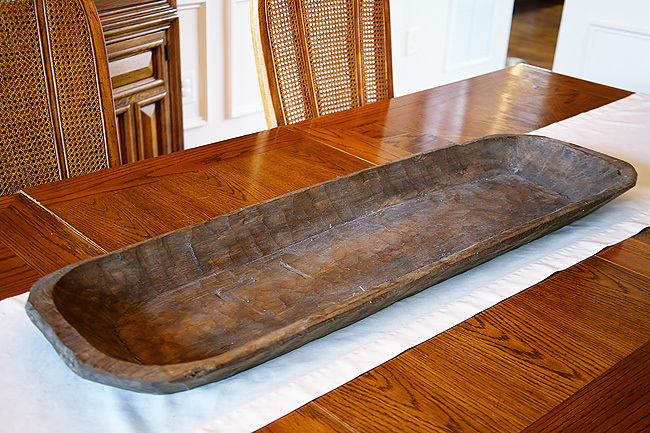 I also found a few other things to decorate the dining room with to tie into the dough bowl. 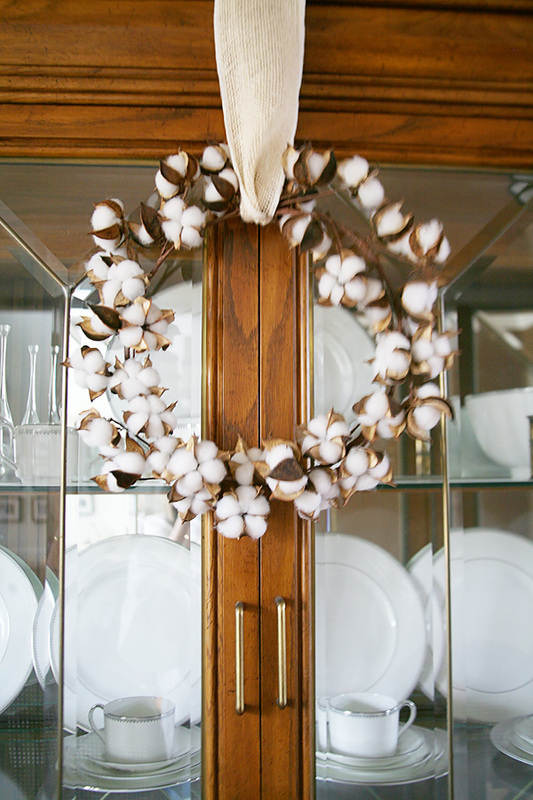 This cotton bloom wreath turned out to be one of my favorites! 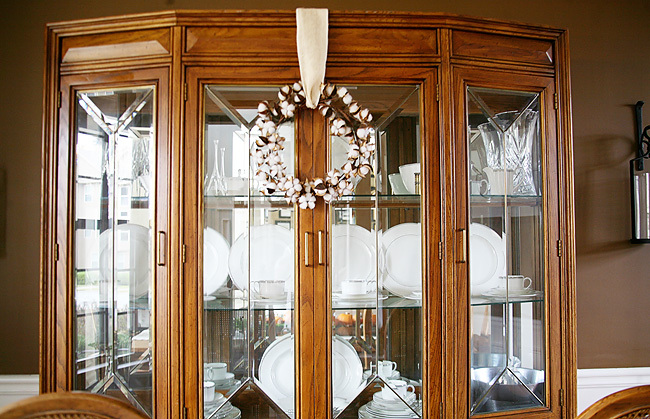 I couldn't wait to hang it with burlap ribbon on my dining room hutch. Oriental Trading is one of those surprising sites that just has a little bit of everything. I used to only think of it as a party supply shop, but I'm beginning to realize it has so much more to offer. I am also always impressed with the quality of their home decor items - especially for the price. 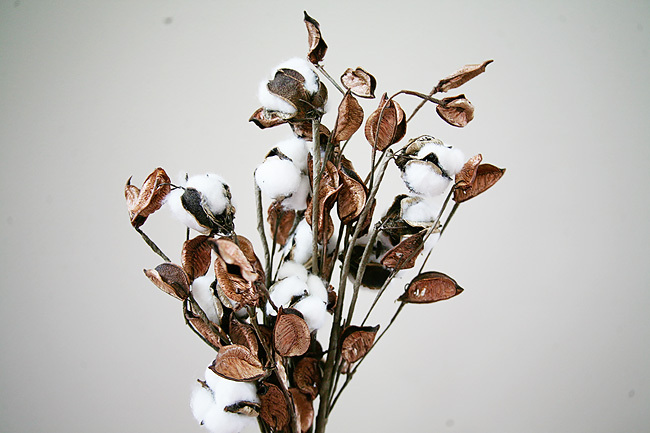 I've seen cotton bloom wreaths around, but never for a better price. Once I put everything together it was exactly the look I was going for. I might tweak the pumpkins a little bit. I originally wanted all white pumpkins, but once I went looking for them there wasn't one available in sight. I gave up the search and embraced the variety of pumpkins look instead. Otherwise it was a super easy way to decorate my dough bowl for Thanksgiving! Now I can't wait to finish the rest of the room just in time for the holidays! 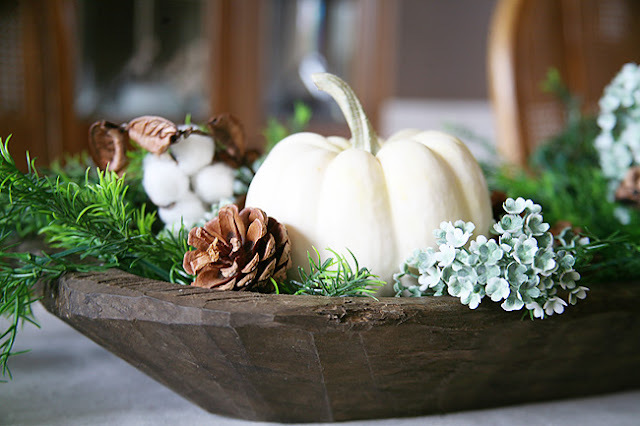 Layer the bottom of the bowl with the faux pine branches. This set comes with three bunches. I placed the third one in the middle for a little more height in the center. Add in the frosted greenery stems. I separated these an added in as I needed. They come apart easily and are super easy to manipulate where you need them. 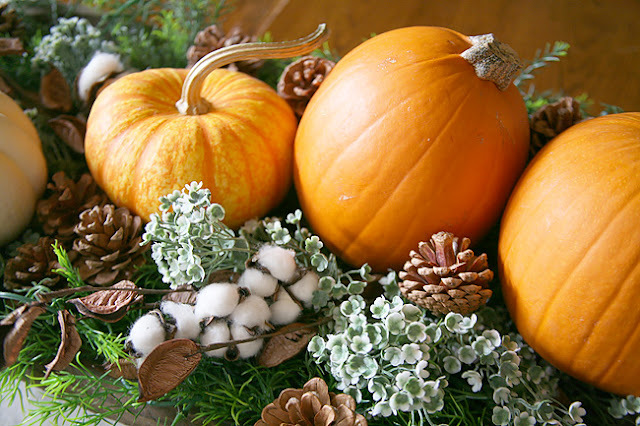 Arrange pumpkins in the bowl on top of the greenery. I placed the largest ones in the center and added smaller ones throughout. 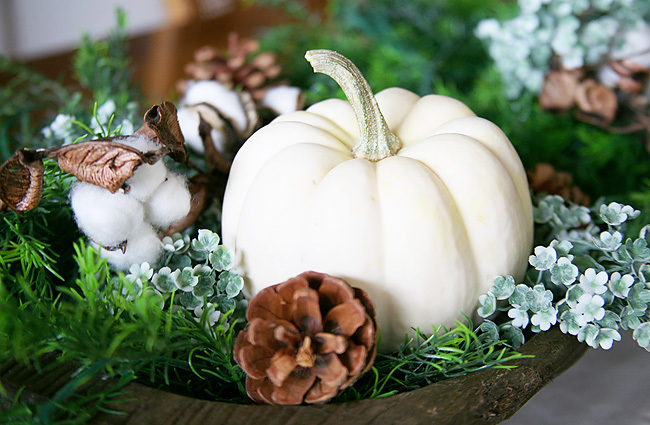 Place the cottons stems in around the pumpkins. I used four stems, but I actually wouldn't mind one or two more throughout depending on how large your dough bowl is. Use pinecones as fillers for any holes. Such an easy project! 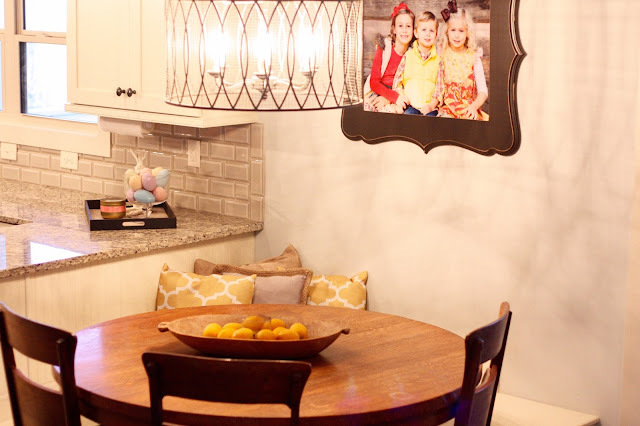 Now here's hoping the rest of the dining room is as easy. Do you have a dough bowl? How do you decorate it? What would you do for the holidays? Perfect timing, I’ve been looking for dough bowl inspiration. Thank you!